Teaching Activity. By Bill Bigelow. 3 pages. 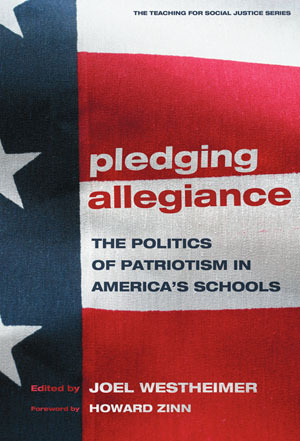 Discussion questions and teaching ideas for examining the history of the Pledge of Allegiance and the political milieu in which it was written. 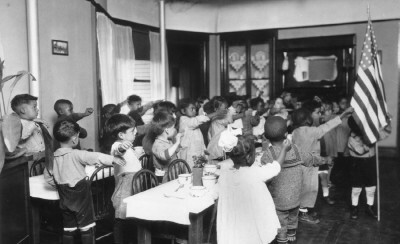 A group of children in a Los Angeles school in 1939 perform the extended-arm salute during the Pledge of Allegiance. Source: Getty Images. I can remember my high school geometry teacher, Mr. Glandon, leading the class in the Pledge of Allegiance every morning. He ordered us to stand at attention, hands over our hearts. Anyone who was less than enthusiastic was branded an “opposition maker”—one of his favorite terms—and awarded demerits. This was in Northern California in 1968, at the height of the Vietnam War, growing militancy of groups like the Black Panthers, and not long after the San Francisco counterculture’s “Summer of Love.” For Mr. Glandon, forcing us to recite the Pledge was his small contribution in the war to preserve one version of America. The Pledge has always been political. It was written in 1892 by Francis Bellamy, and published in the national magazine The Youth’s Companion to commemorate the 400th anniversary of Columbus’ first voyage. This reading was published by Rethinking Schools in an edition of Rethinking Schools magazine, (Summer 1996.) For more articles and lessons like “One Country! One Language! One Flag!,” subscribe to the Rethinking Schools magazine. Book – Non-fiction. Edited by Joel Westheimer. Foreword by Howard Zinn. 2007. Educators address the politics of patriotism in schools. I am a member of the Dine’ Nation and as a small boy, as early as 8 years old, I thought it odd that I was forced to make this “pledge” each day in the public school I attended on my reservation in NW New Mexico. Over the years as I critically examined the pledge, I realized I didn’t feel right about it as it did not acknowledge the First Nations of this land, who have been here since Time Immemorial. So, one day during planning for a cultural diversity training for teachers I decided to write my own pledge that I would heartily cross my heart and say. You are welcome to use it if you desire. I pledge Respect, to the Flags, of the Nations of this Land. And to the Governments, for which They stand. with Freedom and Dignity for all. Francis Bellamy may not be the author of the Pledge of Allegiance. There was a student named Frank Bellamy from Cherryvale , Kansas who in 1890 entered a contest as a class assignment . The contest was sponsored by “The Youth’s Companion” whose editor was Francis Bellamy. Frank Bellamy’s pledge, in his exact wordage and form ,was published in 1892. in that same magazine. It had no byline or credit . People assumed Francis Bellamy wrote it but in a book by Joyce Long there is compelling evidence that Frank bellamy was indeed the author. Bill Bigelow is an excellent teacher who puts together great lessons that engage both students and teachers. I taught for over twenty+ years in Portland Public Schools, and was fortunate to have the opportunity to attend his district workshops…excellent concept…teachers teaching teachers.